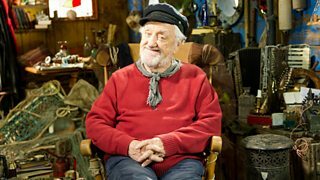 Old Jack’s Boat is a brand new show on CBeebies and features Children's TV legend Bernard Cribbins as ‘Old Jack’, a retired fisherman who lives in a little village on the North Yorkshire Coast. Helped along by a cast of colourful characters, ‘Old Jack’ tells tall stories from inside his old fishing boat. The series is a mix of live action and animation which allows Old Jack to wander along the seabed, visit tropical islands and fly high in the air on balloons always accompanied by his faithful dog, Salty. BBC Children’s programmes have a long history of storytelling shows. Probably the most famous was Jackanory – for which our star, Bernard Cribbins, holds the record for most appearances. The intention of the show was to create new stories that had the feeling of classic fairy tales. This brief attracted Russell T Davies to write two stories for the show - his first work with CBeebies. The writers were asked to come up with fantastic adventures that Old Jack has had in his long life at sea. There are no boundaries to the nature of the stories. Old Jack speaks to the creatures he meets under the sea, he has long rambling conversations with his faithful dog Salty (who often saves the day) and whatever tall tale he comes up with there is always a twinkle in his eye. Wrapped around the story that Jack tells is another story, the story of the village he lives in – Staithes in North Yorkshire and the characters he meets there. The pace of the programme is deliberately gentle to create an atmosphere of warmth and love. The mixture of animation, storytelling to camera and location drama is designed to create an absorbing fictional world that will inspire children’s imagination. The aim of the show is for kids to get lost in a wonderful story featuring characters that over the weeks will become familiar friends to them. Old Jack’s Boat has many stars in it. (Bernard Cribbins, Freema Agyeman, Janine Duvitski, Helen Lederer, Paul Hawkyard and Nadine Marshall) However, most of our guest stars were only available to us for 5 days filming on location. During that time we had to film all their contributions to the 25 episodes plus the green screen shots that allow them to appear in the animated world that Jack creates in the story he tells. This meant a lot of careful planning and some artful shooting to create the effect that the village is always populated by these friends, despite the fact that some of them were never actually on set at the same time! One constant was our lovely dog Salty. Salty is played by “Scuzz” who is owned and trained by Paul Hawkyard who plays Ernie Starboard. Scuzz could well become the real star of the show if the reaction of kids on location is anything to go by. And in case you ask – Scuzz is a Hungarian Vizsla. Why not discover more songs, makes and clips to watch on our CBeebies Old Jack's Boat site. All the latest news and piles of helpful information for CBeebies Grown-ups. The BBC is not responsible for the content of external sites. Read more.